Home cooking from a former chef. We recently replaced our 17 year-old Ducane grill (which Drake had rebuilt twice) with a beautiful new Weber S-450. We had been sans grill for a few months as we researched replacement options for the Ducane and were otherwise occupied with other things. So it was a bit of a celebration to have the S-450 set up and ready to go. But what should we make for our grill inauguration? We settled on fajitas and this refreshing rice and pineapple salad. What I love about this salad is that it's a lighter balance to Mexican entree--and alternative to rice and beans. It also contains jicama, which gives it a fantastic crunch. The holidays are over and we're getting back to our normal routine, including simpler winter fare. This sweet and sour cabbage is my mother's recipe--I'm 51 so I'll let you do the math on how long I've been enjoying this cabbage--but it is a family favorite served with grilled sausages and a baked potato. Warm comfort on a winter evening for sure. It's closing in on Christmas Day, which means it's time for me to make my annual "fruit cake." I put that in quotes because it's more of a pound cake studded with dried apricots, golden raisins, and salted cashews. I've made this cake now for a good 20 years at Christmas--and it would not be Christmas with out it. In fact, if Christmas only consisted of our Christmas tree, Russian Tea Cakes, and this fruitcake, I think Drake and I would be happy enough. I've been making homemade granola since the 1970's when I was literally a granola-munching (and vegetarian) college student. Over the years, my granola recipe has evolved, but now it's settled quite nicely into this maple-orange version. And I eat a lot of this stuff--almost every morning, in fact--with yogurt and fruit. I'm posting the recipe now because I think granola is a tasty and healthy food gift for the holidays--an alternative to all the sweets and other rich food. Just pack it up into a pretty container or wrap it up in some decorative cellophane. You could include the recipe on a hand-written recipe card. The past month I've had a lot of fun building a Ward Street Bistro store with my favorite kitchen items and items top-rated by Consumer Reports, Cook's Illustrated, and Fine Cooking. I purposely decided to keep the number of items in the store small--a collection of versatile items that can serve as a backbone of a well-equipped kitchen. As you can see, our kitchen is cozy and compact; we don't have room for much in the way of specialized equipment. So what you'll find in the store reflects how we equipped our kitchen, with multi-functional basics that allow us to tackle almost any kitchen task. So I hope you'll take a look around the store. And I'd love to get any feedback on what's there. Through our 25 years together, my husband Drake and I have been avid meal-planners. For us, that means we start the week with an idea of what will have for dinner each night, using Sunday as time to get a running start on "food for the week." I hadn't given our system much thought until a year or so ago, when I read an article in the New York Times written by a working mom who uses a remarkably similar system. She had "drawn a line in the sand," unwilling to surrender home-cooked meals for her family. Given current times, it seems more people are cooking at home. I'm completely sold on the advantages of home cooking from a cost, health, and pure food enjoyment perspective. I love the warm and cozy flavors of Fall, which I think come together perfectly in this pasta with roasted radicchio, sun-dried tomatoes, and olives. To complete the meal, I serve it with classic baked acorn squash. The flavors are a study in contrasts: the slightly bitter radicchio, the sweet tomatoes and acorn squash, the salty olives. To top it off, the pasta is garnished with Parmesan cheese, toasted pine nuts, and some fresh basil. It took 50 years, but I broke my first bone (an ankle) last Monday. So, while it's not quite as easy for me to get around in the kitchen these days, I took at least part of my convalescence to update the Ward Street Bistro recipe index. It now includes both photos and text links, organized by recipe category. I think this will be much easier to browse than the previous text-only index. I've been food blogging since March of this year and it's been an absolute blast. One aspect I've especially enjoyed is getting acquainted with other food bloggers. There is some serious talent on the Internets when it comes to food blogging! For this post I'm pleased to feature a recipe from Rachel Rappaport of Coconut & Lime. She graciously agreed to "adopt" me as part of Dine & Dish's Adopt-a-Blogger event. There are so many great recipes on Coconut & Lime, but given that Fall is upon us, I decided to feature Rachel's Apple Cider Cupcakes. I took these to a pumpkin-carving party last weekend and boy, were they tasty! 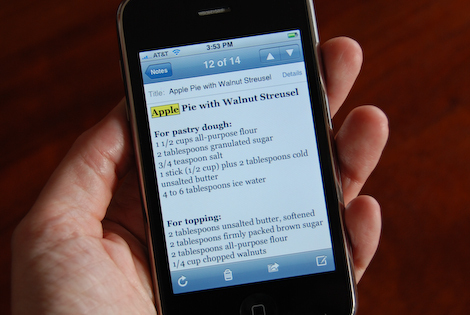 There are countless ways to organize your recipes online and off. I want to share with you a method that automatically syncs my recipes between a website, my home Mac, my work PC and my iPhone. And best of all, I'm doing this all with a single tool: a free version of a program called Evernote. The reason I'm so thrilled with this system is that it lets me plan meals where ever I happen to be: at home, at work, out and about. If I see something at the market that catches my eye - a seasonal goodie or an item on special - I can easily type in the ingredient and pull up recipe options on my iPhone. But even if you don't have an iPhone, Evernote has the advantage of giving you both online and off-line access to your recipes.